Humanity has been looking at the Sun since ancient times. In some cases the Sun has been worshiped as the giver of life. We can readily feel its warmth. We certainly wouldn't exist without it. But the Sun emits not only light and heat in the form of endless streams of electromagnetic photons. It also emits cosmic rays, which have a large effect on the climate on Earth. Cosmic rays are not rays of energy in the standard sense. What are termed cosmic rays are single events of fast moving, high-energy plasma particles that carry an electric charge. 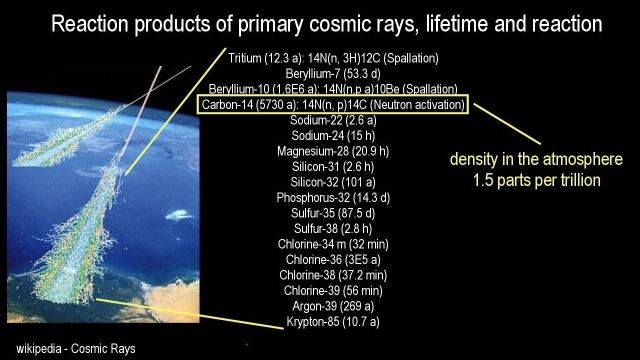 The majority of the 'cosmic rays' are protons. 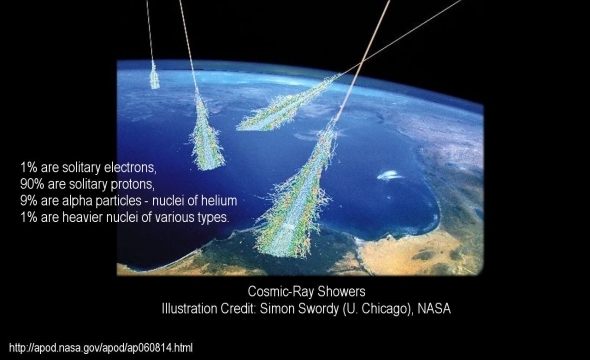 Most of the 'cosmic ray' events that we encounter on Earth flow from the Sun. A small portion also flow in from galactic space that contains potentially 400 billion suns of a large number of different sizes. 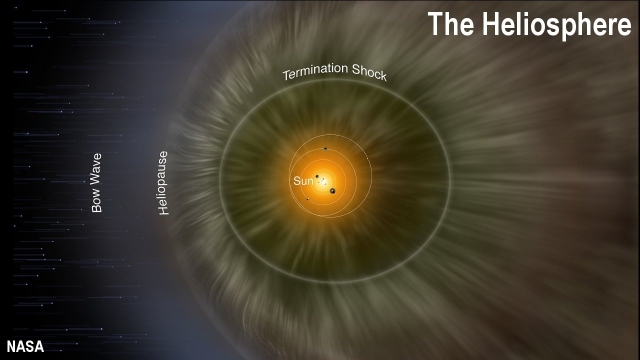 A portion of the galactic 'cosmic rays' are attenuated by a plasma shell that surrounds the solar system, termed the heliosphere, which is formed by the solar wind particles coming to a halt far past the farthest planet. How large a portion of the galactic 'cosmic rays' are blocked by the heliosphere is determined by the strength of it. The attenuation was measured in 2012 as a rather small amount. 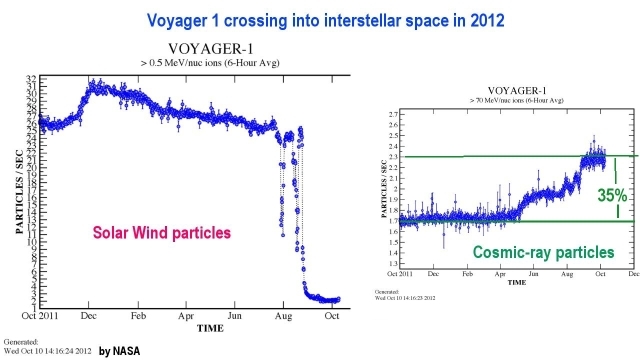 When the NASA spacecraft Voyager-1 crossed into interstellar space in September 2012, it saw the solar wind density diminishing to near zero, as it exited the heliosphere, and it saw the galactic cosmic-ray flux increasing by roughly 35% at this time. This means that the strength of the heliosphere is not a significant factor for changes in cosmic-ray measurements in the solar system, which leaves us only the Sun as the big factor for the large changes in measured cosmic-ray values that have been measured for historic time on the Earth. With cosmic-ray particles being essentially plasma particles, they are 100,000 times smaller than the smallest atoms. Cosmic-ray particles are therefore invisible. Nevertheless, their presence can be detected, and their volume be measured by their effect on the Earth's atmosphere. The interaction of cosmic rays with the atmosphere generates radioisotopes that would otherwise not exist. Most decay rapidly, but some persist for thousands of years, even millions of years. Since most of the cosmic-ray events originate at the Sun, the measurements of the long persistent isotopes gives us the technological means to measure the intensity of the Sun's activity deep into historic times, which is important for climate considerations, especially for Ice Age history considerations. However, before all this was recognized, the changing solar activity over time could only be measured by the changing number of sunspots on the face of the Sun, which reflect changes in solar activity. It began with the invention of the telescope that we discovered that the Sun isn't just a scientifically uninteresting ball of fire in the sky. We discovered that things were happening on the face of the Sun. Dark spots were appearing that roused some interest. The number and the size of the spots were recorded year after year. 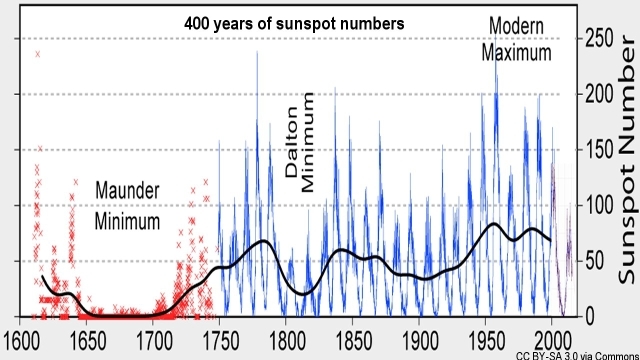 Eventually the numbers were plotted, and the discovery was made that during the big minimum of these sunspot numbers, the Maunder Minimum as it was later called, almost no sunspots were recorded for nearly an entire century. 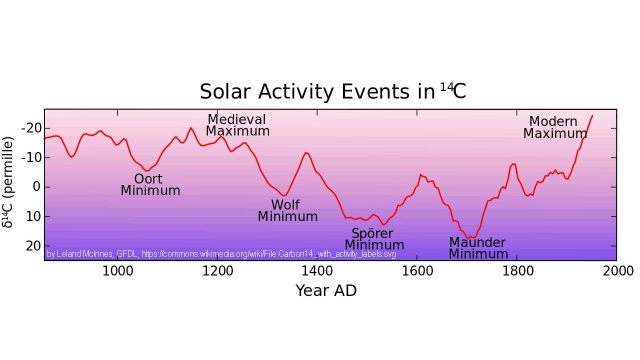 Since this was also the time when the Earth had experienced a deep cold spell, the idea emerged that there might be a connection between the century of cold and the century without sunspots. Everyone suffered under the cold. Major rivers froze up. Agriculture suffered severely. And then in the 1700s the sunspots were back in big numbers, and the numbers were increasing while the Earth was warming up. 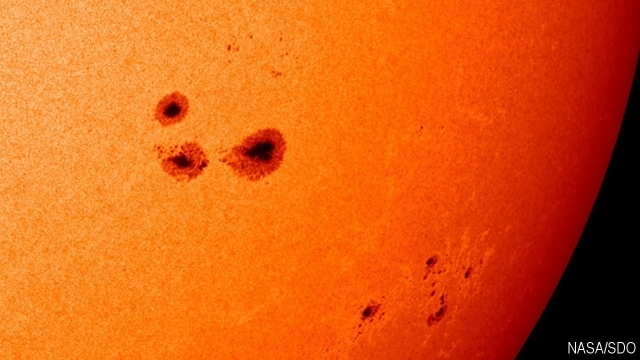 The sunspots apparently had something to do with the climate. When the numbers were big, the climate was hot. With this the idea dawned that the solar activity that was always changing, had a direct affect on the climate on Earth. A massive global warming occurred on the Earth in step with the increasing sunspot numbers. The evermore active Sun gave us our wonderfully livable climate back that eventually enabled highly productive agricultures as we have them today. While the increasing sunspot numbers illustrate plainly that the warming of the Earth from the 1700s to modern time, was caused by the increasing activity of the Sun, we had no way to take this analysis further back into historic time than the time the sunspot numbers had been counted and recorded. This changed in the late 1970s, when scientists discovered a reliable and measurable proxy for historic solar activity that can take us back in time for millions of years, if need be. And best of all, the proxy agreed with the sunspot numbers for the time that the numbers had been recorded. The miracle proxy for solar activity is one of the atomic isotopes that I mentioned earlier, that are created in the upper atmosphere of the Earth by the collision of cosmic-ray protons streaming from the Sun. When one of the fast protons manage to collide with either an oxygen atom or a nitrogen atom in the air, the resulting collision breaks the oxygen or nitrogen atom apart into a Berillium-10 atom and some other fragments. The Beryllium-10 atom has a nucleus of 4 protons and 6 neutrons. The imbalance in its atomic nucleus causes the Beryllium-10 atom to decay into Boron-10 that has 5 neutrons and 5 protons in its core. All Boron-10 on the planet has been created by this nuclear decay process. However, this particular radioactive decay takes a long time. Beryllium-10 is the slowest decaying isotope that is created by cosmic-ray collisions in the atmosphere. It has a half life of 1.39 million years. This means that the volume of Beryllium-10 that we find present in historic samples gives us a measurable proxy for the activity of the Sun at the historic time in which the Beryllium-10 was formed and had settled onto the ground or onto ice sheets, such as in Antarctica. The volume of the Beryllium-10 that has been measured in historic samples provides a measurable value that represents the intensity of the solar activity at that historic time. In the case here, the Beryllium values are presented inverted, because when the solar activity is high, less cosmic-ray flux is produced so that the Beryllium measurements are low. When the Sun is highly active, it is surrounded by a dense sphere of plasma - which is focused onto the Sun from interstellar sources, by which the Sun is also powered. This means that the amount of the Sun's cosmic-ray flux that escapes through the dense plasma, is low, because most of the proton radiation is absorbed in the dense plasma sphere. The result is that fewer cosmic-rays reach the Earth, which results in low Beryllium numbers. Inversely, when the plasma sphere surrounding the Sun is less dense, which causes the Sun to be less-intensively powered and to be less active, the escaping cosmic ray particles are more abundant. This means that a greater volume of Beryllium-10 is being generated by a weaker Sun. By utilizing this principle, we can determine the strength of the Sun and its solar activity at any point in historic time with an amazingly high resolution. Beryllium takes only 2 years to settle onto the ground. It's resolution is so great that the measured numbers even fluctuate with the solar cycles and accurately match their trend. 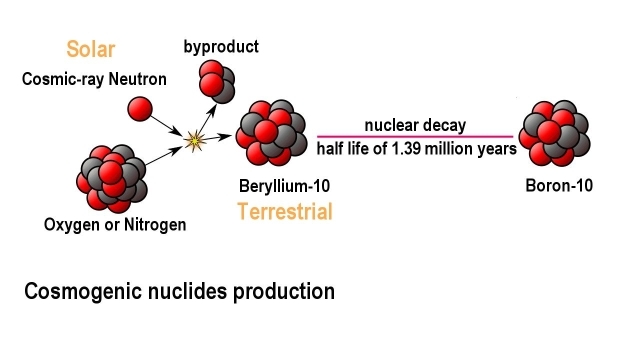 Beryllium-10 is also not the only radio-isotope produced by the Sun. Another isotope is Carbon-14, which likewise reflects the solar activity trend amazingly well though with less resolution in details. 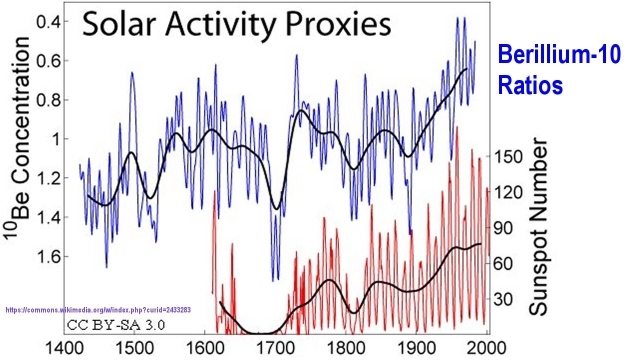 The Carbon-14 isotope measurements show extremely well how the fluctuating solar activity diminished towards the Little Ice Age, and then was ramped up again. 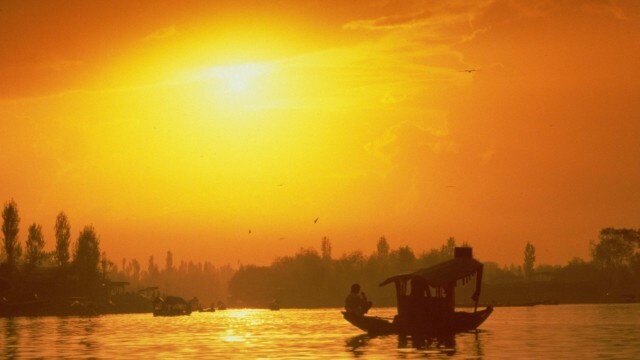 The ramping up of the Sun gave us almost 300 years of increasing solar global warming. Unfortunately, the Carbon-14 isotope is a fast-decaying isotope that has a half-life of only 5,400 years. Its fast decay time makes it unsuitable for looking back in time deep into history. In contrast, Beryllium-10, with its half-life of 1.39 million years enables us to extend our solar exploration deep into historic time, way past the timeframe shown here. With it we can explore the solar activity trends deep into the Ice Ages. I recently came across a graphic that plots the relative Beryllium-10 production rate all the way back 140,000 years, as it was preserved in the Ice of Antarctica. 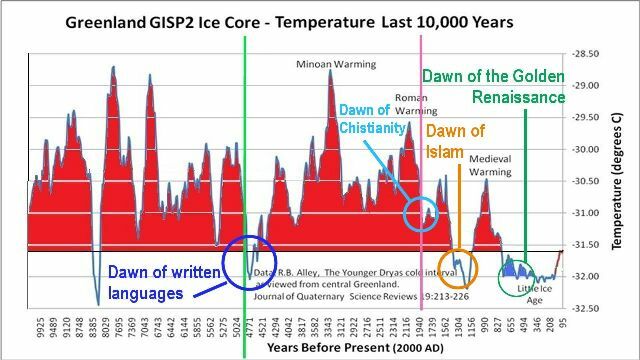 I found the graphic presented here in the book, 'Earth Under Fire: Humanity's Survival of the Ice Age' by Paul A LaVolette. 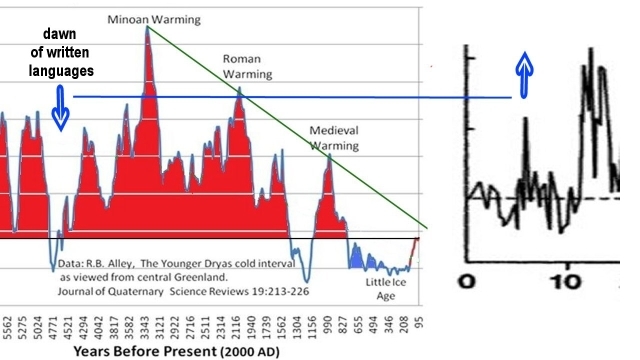 In the book, it is the climate record that is plotted inversely rather than the Beryllium record, in order to reflect the inherent inverse relationship of solar cosmic-ray flux and its effect on the climate. The result is interesting, because it reveals a few surprising details. The first thing that stands out, is the spike in Beryllium production at roughly 5000 years before the present. What does this spike tell us? 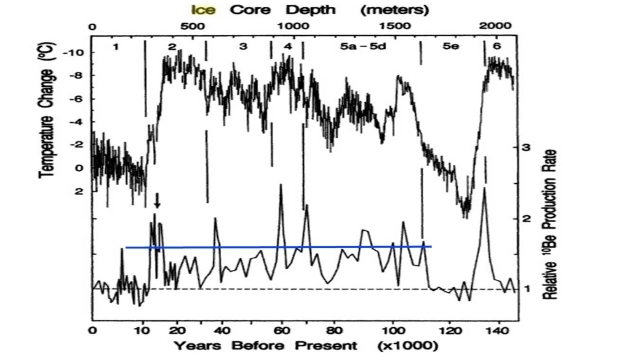 If we look at the Greenland ice core climate record, at the temperature value at 4770 years before the present, we see a big low-temperature climate indicated. This temperature drop took us as low in the temperature record, if not lower, than the little Ice Age had taken us in later years. The coincidence of the Beryllium spike for this timeframe, shown expanded here, tells us that this period of deep cold climate was caused by the Sun. 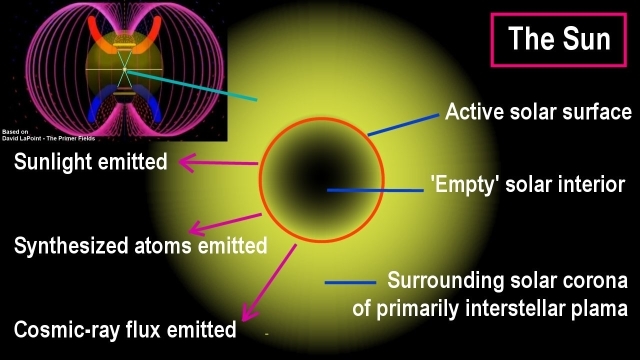 When the Sun weakens, its surrounding plasma sphere is likewise weaker, which enables more cosmic-ray flux to escape from the Sun and affect the Earth. We see the result here in the form of an increased Beryllium production in the atmosphere. That's what the spike represents. We also see the result of cosmic-ray ray showers affecting the Earth in the form of increased cloudiness.Increased cloudiness makes the Earth colder, because the white top of clouds reflect a greater portion of the sunlight back into space, which thereby becomes lost to us. The resulting colder climate is thereby the result of a weaker Sun. Cosmic-ray flux ionizes the water vapor in the atmosphere, which leads to increased cloudiness. The spike in Beryllium, for this time, tells us that the Sun was extremely weak at this time, and was emitting high rates of cosmic rays, which produced high rates of Beryllium-10. Some type of anomaly had evidently affected the plasma supply stream of the Sun for a few decades; and consequently, as it must, the climate had responded by getting colder. This all by itself tells us that the Sun is the indisputable master of the climate on Earth. However, the Sun is not its own master. This means that the Beryllium production serves us as a measurable indicator of how weak the solar system as a whole had become at a specific time, and the Sun with it. Next, let's look at the two consecutive spikes between 11,000 and 15,000 years be fore the present. These spikes shouldn't be there. We are still in glacial climate. The spikes seem to indicate that the interstellar plasma stream was getting stronger again, strong enough to get the Sun ramped up again, to awake it from its long glacial low-powered hibernation. The two spikes are evidently not the result of an extraordinarily weak Sun, with a weak plasma shield around it. Instead they represent the result of a weak Sun being ramped up. The weak Sun had almost no plasma shield around it during its glaciation time. When a hibernating Sun gets ramped up again, large volumes of solar cosmic-ray flux are generated by the suddenly active Sun that has no active shield around it at the time, so that large volumes of cosmic-ray flux are able to escape. The two spikes are telling us that the Sun was actually restarted twice. The first restart appears to have failed. The plasma inflow was evidently not dense enough for the first startup, 15,000 years ago, to sustain full-power solar operation. The startup failed and glaciation conditions resumed for another thousand years till the plasma density was sufficient to form primer fields again that focus plasma unto the Sun, with enough plasma-density inflowing this time for the startup to succeed. We see the two consecutive Beryllium pulses reflecting the two-step process to get the Sun ramped up to the current interglacial high-power mode. After the startup succeeded, the Beryllium pulse ended, because by then, the fully-powered Sun had a dense plasma sphere around it, in which most of the solar cosmic-ray flux becomes trapped. In the mechanistic universe, in which the Sun is deemed to be invariable and not a climate factor, the end of the last Ice Age is placed at 15,000 years ago. It is reasoned that the end of the Ice Age brought so much melt water into the oceans that it changed ocean currents, which is deemed to have brought the Ice Age back. This is a long-believed theory. However, the two spikes in the Beryllium record now prove this theory to be invalid. 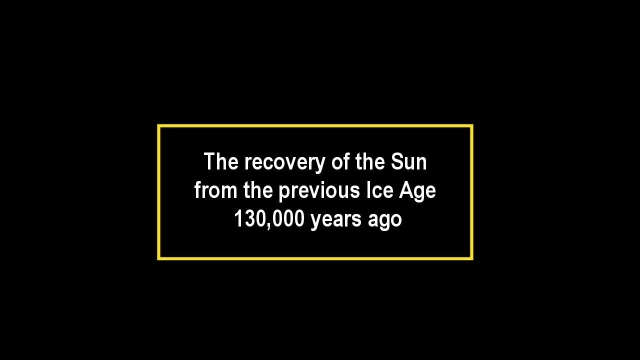 The recovery of the Sun from the previous Ice Age 130,000 years ago. The Beryllium spike that occurred 130,000 years ago, evidently resulted from the plasma input-streams to the Sun recovering in density to interglacial levels. The plasma density pulse at 130,000 years ago was evidently strong enough to up-ramp the Sun all the way through to its continuous operation, without a failure on the way. 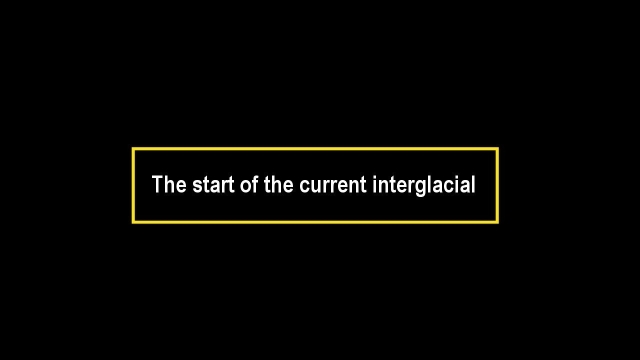 The end of the pulse ushered in the previous interglacial period. The large spikes that we find between the end of the glacial periods and the start of the interglacial periods, tell us that the Ice Ages were caused by the Sun hibernating during the glacial times, and the Sun's reawakening with strengthened input plasma streams that generate high-volumes of solar cosmic-ray flux on the Sun as the Sun rebuilds itself to its interglacial high-power state. This means that the two little spikes between 11,000 and 15,000 years ago, and the big one 130,000 years ago tell us the same story, and they tell us that the time has come to rethink our perception of the universe, and consider the plasma dynamics as the driver of our Sun, and the Sun as being the climate driver on Earth, as a changing engine that affects us on Earth in a big way, including with the causing of the Ice Ages. Also note that when the solar awakening is complete, the cosmic-ray flux returns to a low volume all the way through the interglacial period, as shown in the Beryllium record. Then, when the interglacial period ends, when the primer fields collapse that focus plasma onto the Sun, the Sun reverts back to its low-power hibernation state that creates the glaciation period, which is a state of relatively high cosmic-ray flux for the lack of a shield against it. The interglacial Sun versus the glacial Sun. 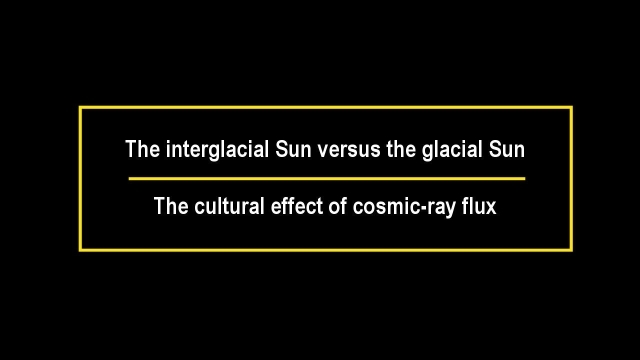 - The cultural effect of cosmic-ray flux. It is interesting to note that for the entire glaciation period, the plotted Beryllium record is substantially high all the way through the period. 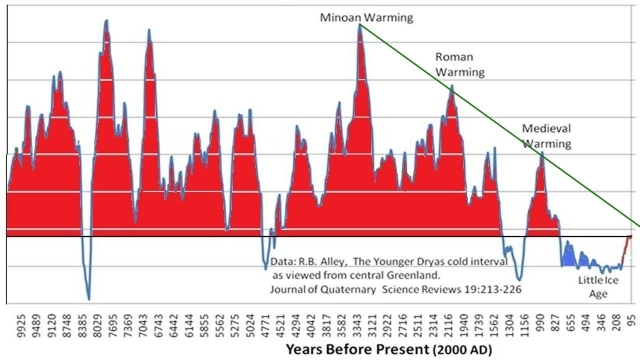 It should be noted too, that the high Beryllium level during the glaciation period was produced by cosmic-ray flux originating from the unshielded 'hibernating' Sun, which is a relatively cold Sun, potentially 70% colder than the present Sun. This means that during glacial times the cosmic-ray flux is not the only determining climate factor. 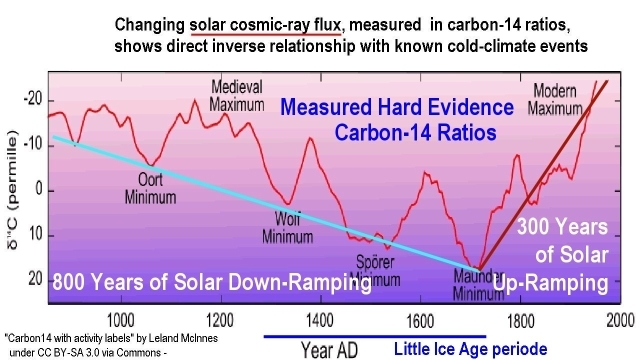 The colder Sun is instead the major climate factor, while the cosmic-ray flux does have a minor effect on the Ice Age climate. Inversely, during interglacial times, the cosmic-ray flux is a strong climate factor, because its ionizing effect affects cloudiness in a big way. Cloudiness is strong during interglacial times. 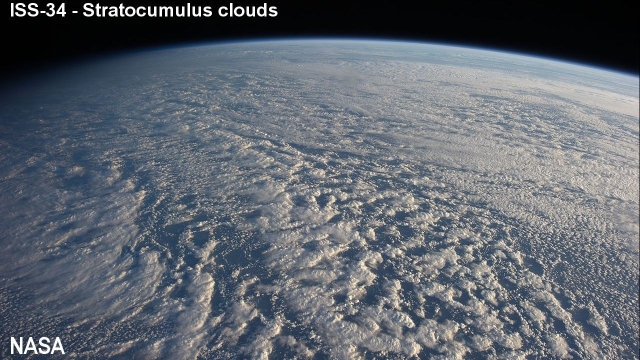 The warm oceans under the hot interglacial Sun evaporate large volumes of water vapor. During the Ice Age glaciation period, with 80% less moisture in the air, cloudiness is a lesser factor, though it is a factor in the form of ice fog. 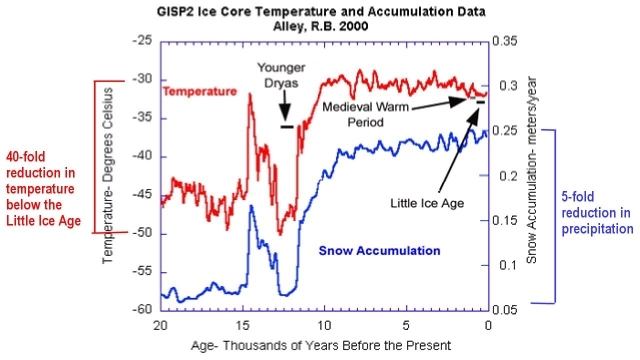 The determining factor during the Ice Age glaciation period is always the low surface temperature of the hibernating Sun, which is also changing during glacial times. It should be noted too that the average Beryllium level during the glaciation period was roughly at the same level as that of the spike 4700 years ago. This is significant, though not for climate reasons. The high level of the Beryllium spike 4700 years ago, is important, because, as I have previously indicated, the high rate of cosmic-ray flux that had produced that spike 4700 years ago, had also caused a phase shift in human history. We see such high Beryllium levels all the way through the last Ice Age, to varying degrees. 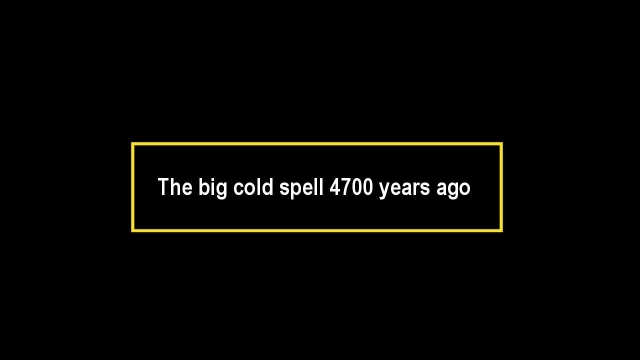 And we will see it again through the next Ice Age. The deep-cold period around 4700 years ago, which reflects the high-volume cosmic-ray background measured in Beryllium-10, was the historic timeframe in which written languages were invented and came into general use. A high-volume cosmic-ray background appears to have this effect. This type of cultural uplift is what we will likely experience all the way through the next Ice Age. Cosmic-ray particles are fast moving plasma particles, primarily protons, which are 100,000 times smaller than the smallest atoms. They are so tiny, that they pass through a human body without colliding with anything. 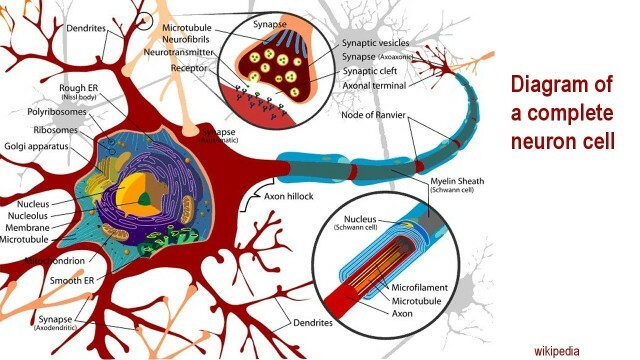 But as they path through us, their moving electric charge leaves behind a minuscule trail of induced electric currents that appear to be beneficial for human cognitive development. History tells us that all the great cultural achievements were wrought or started in the cold times that are times of high-volumes of cosmic-ray events. It is not surprising in this context that the biggest breakthrough, the dawn of high-level written languages, which furnished the foundation for all the subsequent cultural advances, including that of science, technologies, and energy development, occurred at the time of that biggest spike in cosmic-ray flux 4700 years ago, right in the middle of the development of our high-level civilization. That spike may have enabled us to be what we are today. It is interesting to note here that the big Beryllium spike at 4700 years ago, is roughly equal to the average Beryllium level all the way through the last glaciation period. This means that we have some revolutionary cognitive, cultural, scientific, even technological and spiritual developments to look forward to as we enter the next glaciation period that promises a similar high-level cosmic-ray background. We may be closer to this happening than we yet realize.